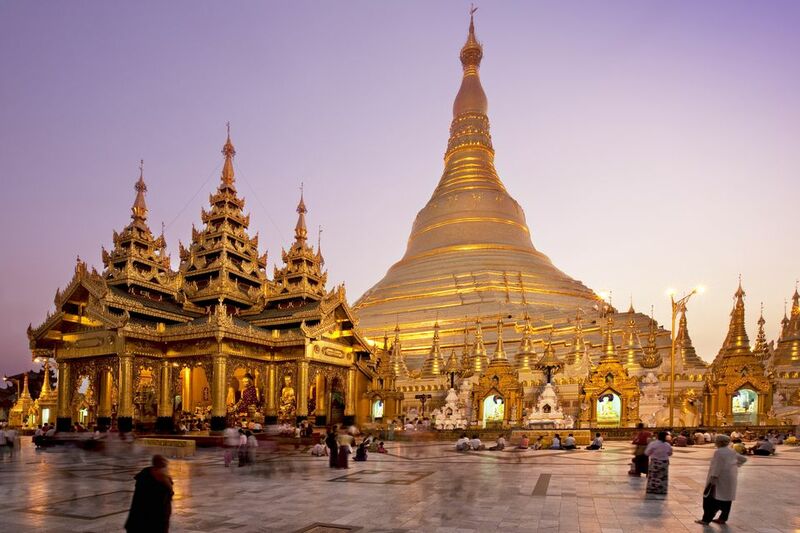 The Shwedagon Pagoda in Yangon is Myanmar’s most sacred religious monument. Standing prominently atop a big hill in the former capital, the 325-foot-tall (99 meters) golden stupa shines brilliantly in the afternoon sun. The monument produces a mesmerizing glow at night inviting a return visit after dinner. The complex around the pagoda contains scores of Buddha statues, relics, and historical artifacts dating back over 2,500 years. A visit to the Shwedagon Pagoda is considered a must when traveling in Burma/Myanmar. Open Hours: The Shwedagon Pagoda is open seven days a week from 4 a.m. to 10 p.m. Last admission is 9:45 p.m. Visitor Center: The visitor center is open daily from 8 a.m. to 9 p.m. Accessibility: Elevators and wheelchairs are available at the southern entrance of the pagoda. Water: Communal water coolers are available around the pagoda, but you may want to bring your own water. Bring a hat and sunscreen; afternoon temperatures in Yangon are hot throughout the year. Food: Although food carts are available around the monument, you'll find better food in local restaurants elsewhere. Although you should dress conservatively (cover your knees and shoulders) when visiting any of the temples in Southeast Asia, the rules are often more relaxed for tourists in places such as Thailand. That’s not the case at the Shwedagon Pagoda. The pagoda is much more than a tourist attraction—it is the most important religious site in Myanmar. It is also a functioning, very active place of worship. Scores of monks, pilgrims, and devotees mix among tourists at the monument. Men and women should wear clothing that covers the knees. Longyi—a traditional, sarong-style garment—are available to borrow at the entrances. Shoulders should not be exposed. Avoid shirts with religious themes or offensive messages (that includes skulls). Tight or revealing clothing should be avoided. Although the official website for the pagoda claims that elbow-length shirts are required, this is rarely enforced. You’ll be expected to remove your shoes and leave them at the entrance for a small fee. Shoes are looked after at a proper counter, hence the fee. You'll be given a numbered claim check so don’t worry about someone swapping flip-flops with you. Socks and stockings are not allowed—you must go in bare feet. The Shwedagon Pagoda is located on Sanguttara Hill in the Dagon Township of Yangon in Burma/Myanmar. Any taxi driver in Yangon will gladly take you. There’s no need to have the driver wait; plenty of taxis will be waiting around the pagoda when you exit. Although taxis are very reasonably priced in Yangon, prices are slightly inflated for tourists who are visiting the pagoda. Don’t be afraid to negotiate a little with your driver. Aside from Buddhist holidays based on the lunisolar calendar, weekdays are often more quiet at the Shwedagon Pagoda. The site is busier during Buddhist Lent (usually in June). Many Buddhist holidays start the day before a full moon. You’ll get much better light for stunning travel photographs if you visit early in the morning. Temperatures can climb to almost 100 degrees Fahrenheit by noon, making the white marble flooring hot on bare feet! Visiting the Shwedagon Pagoda after dark is an entirely different experience. An ideal scenario would be to visit in the morning when light is good for photos and before the heat of the day, go explore some other interesting sights in Yangon, then return to the pagoda in the evening when everything is lit up. Dry season in Yangon is from November to April. The months of June, July, and August are usually the rainiest. As soon as you enter, you’ll probably be approached by friendly, English-speaking guides offering their services. You may be shown a book of comments in various languages from their previous customers. Some guides are official and licensed, while others are much more informal. The average fee is around US $5, plus a small tip of $1 or so if they performed well. Agree on a clearly established price before accepting any services. Whether you hire a guide or not is completely up to you. Just as with booking tours in Asia, you may gain more knowledge and insight by hiring a guide. But at the same time, you'll miss out on the thrill of discovering some things on your own. A good compromise is to leave time at the end of your tour to wander around without the distraction of someone speaking. People watching at the Shwedagon Pagoda can be very interesting. You may have friendly monks approach you to practice English. The actual pagoda is constructed of brick that has been painted and covered with gold plating donated by monarchs and supporters from around the world. The umbrella crown that adorns the top of the Shwedagon Pagoda is 43 feet tall and covered in 500 kilograms of gold plates that are attached with rivets. At 2017 gold prices, that's approximately US $1.4 million in gold plating alone! A total of 4,016 gold-plated bells hang from the structure, and over 83,850 jewels are said to be a part of the pagoda, including 5,448 diamonds and 2,317 rubies, sapphires, and other gems. The very tip of the stupa is said to contain a 76-carat diamond!